One of my biggest struggles when I cook is coming up with vegetarian dishes that the family will enjoy!! We keep reading about how it is much healthier to reduce our consumption of meats, especially the red ones, but when it comes to cooking and serving a meatless meal to my family, it has to be a really good one so I don't get that grim look. Don't know if the perception that for a meal to be complete and appropriate "meat" has to be a prominent component, is a Middle Eastern thing or shared by people from other countries and cultures as well?!? The Marinara Sauce over pasta is one those dishes that the family doesn't miss and ask for the "meat"; they actually ask for a second and even third serving! I prepare Marinara Sauce in large quantities so I can have leftovers for freezing. Many times, I double and triple the portion so that I can divide and freeze. I got the recipe for the Marinara Sauce from my dear aunt years ago. Over the years I adapted it a bit, especially the method of preparation as I was too lazy to do all the required steps. The final product is amazing and very easy recipe for preparing yummy Marinara Sauce. I am sure you will enjoy it! Any pasta kind you prefer. The marinara sauce above is sufficient for about 2 packs of pasta depending on how much marinara sauce you prefer. Core the tomatoes like the picture below. Place all the tomatoes in a pan. Add the 3 cups boiling water, close the lid and boil on medium flame for 10 minutes. Add the garlic and basil and simmer, covered for 5 minutes. Then with a handheld blender (or the food processor) process the tomato-garlic-basil mixture until smooth. Return the pan to fire, add the sugar, salt, black pepper and vinegar. Simmer for 30 minutes, stirring occasionally. Add the olive oil and stir for 5 minutes. The marinara sauce isn't a thick paste-like sauce, but a watery one similar to the consistency of cooking cream. Also, if you taste, don't be worried that it is rather salty and the garlic-basil flavor strong, remember Marinara Sauce will be mixed and served with pasta; together they make a perfect combination. Their are two ways to serve Marinara Sauce: First: serve each of the pasta and marinara sauce in separate dishes and each person pours his portion in his/her plate. Second: one minute before the pasta is done, remove 1/3 cup of the pasta water, then drain the remaining water. Return pasta to pan and add the marinara and 1/3 cup pasta water, simmer for a few minutes until pasta is done. 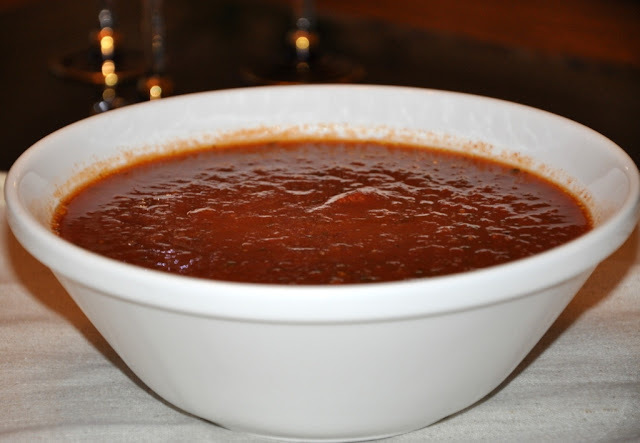 Hope you enjoyed today's easy recipe: Marinara Sauce. Bon appetite.